287% YOY increase in unit sales from events. 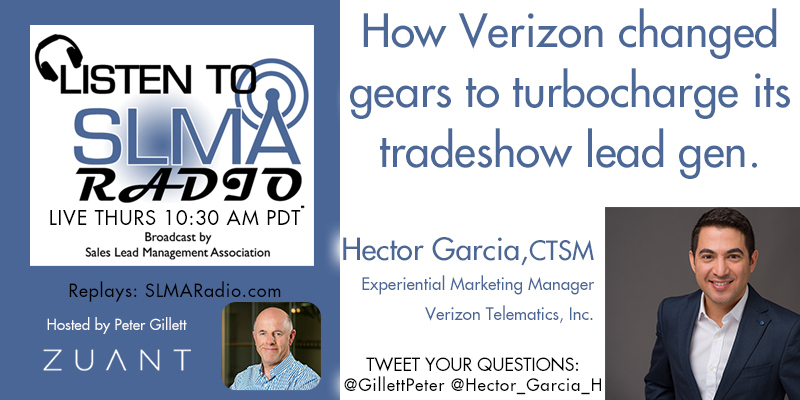 Hector Garcia is Experiential Marketing Manager for Verizon Telematics, and based in Southern California. Hector is responsible for event strategy to support the full suite of products in the Telematics organization: Fleetmatics, Networkfleet, Telogis, OEM partnerships, and Hum the automotive aftermarket consumer product. Since joining Verizon Hector has focused on enhancing events with structure, technology, and analysis of results to increase the returns from investments in their event programs. Prior to Verizon Hector was with HD Supply Facilities Maintenance where he led event programs and had owned an event agency before that. Verizon Telematics is now a global leader in implementing the next generation of connected services for vehicles, centered on a core platform of safety, security, convenience and infotainment offerings. The company offers a portfolio of services through its commercial fleet, aftermarket and original equipment manufacturer (OEM) offerings. Today Verizon Telematics operates in more than 40 markets around the world and offers comprehensive services to consumers, automakers, and dealers, providing technological and service expertise to power connected-vehicle products around the world.